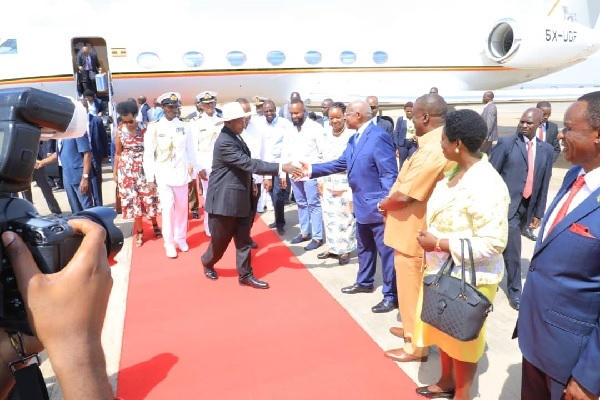 President Yoweri Museveni arrived in the city of Mombasa this morning. He was received by his host President Uhuru Kenyatta at Moi Internation Airport Mombasa. Also on the tarmac was the Deputy President William Ruto, Minister of Foreign Affairs of Uganda Hon. Sam Kutesa, Cabinet Secretary for Foreign affairs Kenya Hon. Monica Juma among others. The two leaders are heading to State house for bilateral talks and later in the day will address the Kenya-Uganda business forum which is on going at the White Sands hotel.